Fleetwood boss Joey Barton hailed FA Cup hero Paddy Madden as his 10th goal of the season and 100th in English football fired Town towards the third round. 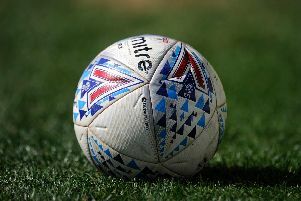 Madden’s 28th minute strike sent Town on their way to a 2-1 victory at National League North side Guiseley, with Wes Burns’ fortuitous effort in the 31st minute doubling the lead. Two minutes later Ash Eastham’s tame pass put Alex Cairns in trouble and the Fleetwood keeper cleared straight to Alex Purver, who chipped home to give the home side hope but Town held on to earn a home tie with League One rivals AFC Wimbledon. Barton was full of praise for Madden and said: “Their defender scuffs his clearance and Paddy does what he does best, which is put the ball in the net. “I’m surprised he took the second touch because he normally puts them away with one touch. He composed himself, picked his corner and gives us the lead. “It is so big to have someone in your side who can get a goal. He is probably unlucky not to have a second with the one that comes off the bar. Barton also felt Burns deserved his goal, adding: “Wes charges the keeper down – you buy a ticket and sometimes you win a prize. James Wallace was selected but a calf strain saw him replaced in the starting line-up by Nathan Sheron. The home draw is perfect for Barton. He said: “These ties can be different on your own pitch. The Guiseley surface is not the worst but is not what we are used to at the training ground or Highbury. “It would have been nice to win by a number of goals but the key is progressing. “If you can’t get a big side the next best thing is a home tie and we have that.